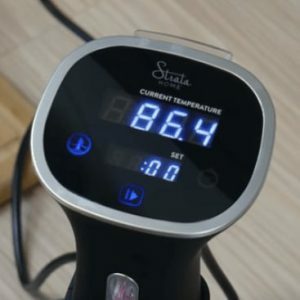 The Monoprice Strata Sous Vide is a mid-level model that's a great value when it's in stock and the price is under $50, other wise consider the Wancle Sous Vide SVC001. $69.99 Current Price - YOU SAVE $24.77. The Monoprice Strata Sous Vide is a mid-level precision cooker that's a great value, but only if you buy it when it's in stock. This is an imported model that occasionally suffers from supply chain problems. If it's in-stock, the price is usually under $65. If it's out of stock the price jumps up to over $100. An alternative is the Wancle Sous Vide SVC001 for $87.99 which is our second highest rated model. This model puts out 800 watts of power, which is below average for the models we reviewed. It has a flow rate of 2.2 GPM, which is higher than 2.0 GPM average for the models we reviewed. The high flow rate of this model means it will reach it's cooking temperature quicker than the average model we reviewed. We liked this model more than we thought we would, however it has a price history that's really wide. 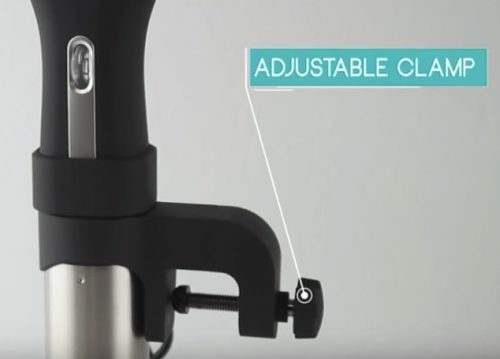 We only suggest purchasing it if it's in stock and the price is under $65, otherwise consider the Wancle Sous Vide SVC001 instead. 16" x 3.75" x 3.75" 11.1" x 14.8" x 4.5" 16" x 3.5" x 3.5"